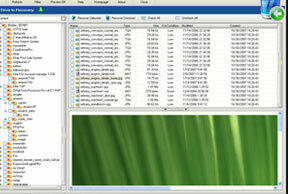 Free Data Recovery Software is portable program. That means, it doesn't require installation and it doesn't put any dependant files outside of program directory. You can run it from usb drive or any other removable memory device. 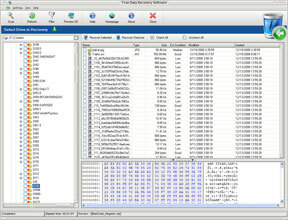 Picture shows a default, skinned window of FDRS. If you prefer to have default Windows look turn off the skinned look in the Settings pull down menu. 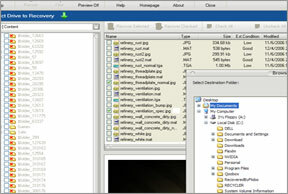 The main program area shows the lost files directory structure, similar to Windows Explorer, with two split windows. You can browse through folders and select multiple files in multiple folders, and multiple folders itself by using a selection check boxes. Preview area can show textual documents and pictures, allowing you to quickly see the state of those for possible recovery. Manu formats aren't supported so use this for a quick preview only. Condition indicators (low, middle, good) indicate a recoverability state of files. They serve as an aid only, don't rely on them too much. 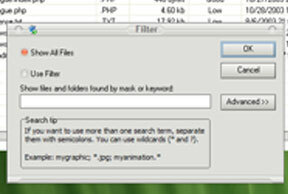 Use filter option to show only files that are contained within your filter keyword. That is a very quick way to find desired files, presuming that you remember their names, even part of name because FDRS supports wildcard filtering. Once happy with selection press "Recover Selected" option and choose a drive, or other memory device to extract recovered data to. Never save recovered data to the same drive you are recovering from!